One of the most versatile firearms in the world, the 20 gauge is a fantastic choice for small and big game hunting, self defense, and target shooting. Capable of throwing out large amounts of lead with manageable recoil, the 20 gauge is a great choice for several different shooting applications. 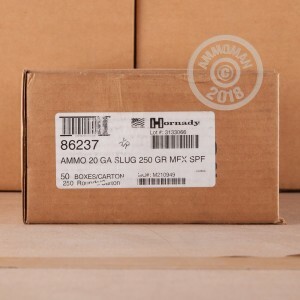 Hornady has been in business since 1949 and in that time they have risen to the top of the ammo world with their persistence, innovation, and high quality ammunition. The Superformance line is designed to be versatile and exhibit high velocity without increasing felt recoil or muzzle blast. 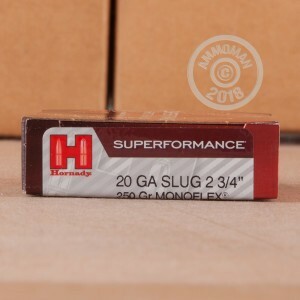 With these massive 250 grain monoflex sabot slugs that are loaded into 2-3/4" hulls from Hornady, you have the high quality, highly effective shells you need to protect yourself or go big game hunting. 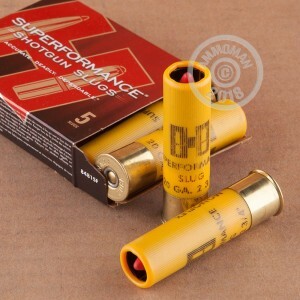 These slugs are designed to be fired through rifled barrels. Remember, at Ammoman.com all orders over $99 will ship for FREE!